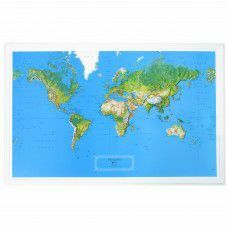 This World Raised Relief Map shows relief on the continental land areas. NCR stands for "Natural Color Relief" and means that the deserts appear brown and the forested areas appear in green. Prominent features on this Raised Relief World Map include the Plateau of Tibet, the Ethiopian Highlands, the Andes and the Rocky Mountains.